When a fourth child was born to Finarfin, prince of the Noldor, and Eärwen, princess of the Teleri, her father named her Artanis, which is 'noble woman'. She was unusually tall and strong as she grew, and so Eärwen’s name for her was Nerwen, 'man-maiden'. Though the source of her hair colour was from her parents, it was said among the Eldar that her hair had captured the light of the Two Trees in Valinor, which resulted a very unique and dazzling colour of gold and silver. According to a legend, this is how Fëanor conceived the idea of capturing the light of the trees inside the Silmarils. Despite her mixed blood, she was identified as a princess of the Noldor, as her father was the third son of Finwë, High King of the Noldor. During the Darkening of Valinor, she was very independent and visionary. She swore no oaths but the words of Fëanor concerning Middle-earth kindled a desire in her heart, as she was eager to see those wide unguarded lands and rule a realm of her own. During the troubles that followed, even though she participated in the revolt of the Noldor, she fought against Fëanor in defence of her mother's kin in the Kinslaying of Alqualondë. Accounts suggest she travelled among the second group led by Fingolfin, which joined the battle at Alqualondë late and without knowing how it had started. Some of that group had not participated in the killing, although it is not clear who and how many. Dismayed by the prophecy of Mandos, her father Finarfin abandoned the march of the Noldor and returned to Valinor. But Galadriel and her brothers crossed the Helcaraxë in far north and arrived to the northern shores of Hither Lands. When King Amroth son of Amdír perished, Celeborn and Galadriel ruled Lindórinand jointly, and were called the Lord and Lady of Galadhrim. 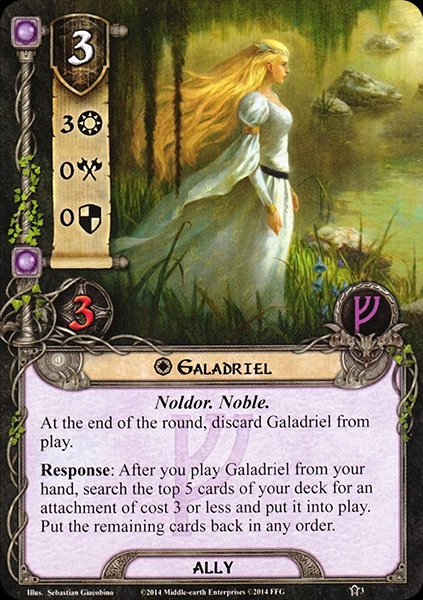 Galadriel planted the mallorn seeds brought with her from Lindon, the only mallorns east of the Sea, and afterwards the realm was called Lórinand (Valley of Gold) and Laurelindórinand (Valley of the Singing Gold), which through some transformations turned into the later name of Lothlórien or Lórien. They established Caras Galadhon, and the realm of Lothlórien was one of light and life. With Nenya, the Ring of Water, Galadriel made the realm of Lórien even greater. With the power of her ring, she protected it from the intrusion of evils throughout the Third Age.It was during their days of power and glory in Lothlórien that Celebrían, their only child, married Elrond, a close friend of Galadriel’s and bearer of Vilya after the death of Gil-galad during the Alliance. Celeborn and Galadriel had three grandchildren by her, one of whom, Arwen, they were especially close to. But Celebrían was waylaid and tortured by Orcs in T.A. 2509, and passed West over the sea. Not long after the departure of the Fellowship she received the resurrected Gandalf. She reclothed and re-equipped him, giving him a new staff. After Gandalf left, Lothlórien was subjected to three successive attacks by armies coming out of Dol Guldur. By the power of her Ring they were thrice repulsed. Celeborn then led an attack on Dol Guldur itself. Once the dark fortress was in the hands of the Galadhrim, Galadriel came, threw down its walls, and purified it of its evil. It was her last act of power, for the One Ring was destroyed, and the strength of Nenya waned and eventually vanished almost completely. Galadriel was very beautiful, her hair being the most notable feature about her. It reminded the Eldar of the light of the Two Trees. Galadriel, at least in her earlier years, was of a somewhat proud and rebellious nature. She was free-spirited, and during her time in Aman had many dreams of wide unexplored lands. In her early youth, she was very willful and of an 'Amazon' disposition; and bound up her hair as a crown when taking part in athletic feats. Her favorite brother was Finrod, for he, too, shared this vision. She could explore the minds and hearts of others, and her gaze was seeing. It may be because of her unusual beauty and power that she became proud. Galadriel is a Sindarin name translated by Tolkien as 'glittering garland', 'Maiden crowned with gleaming hair', and 'maiden crowned with a radiant garland'. It has been suggested that Galadriel consists of galad ('light, radiance') + rî ('crown') + iell ('daughter'). 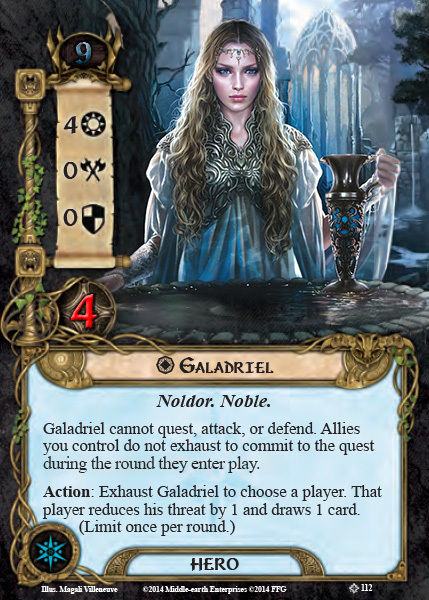 Tolkien notes that the element galad had no relation to Sindarin galadh ('tree', or Silvan galad 'tree'), but that such a connexion often was made and her name then was pronounced Galadhriel. 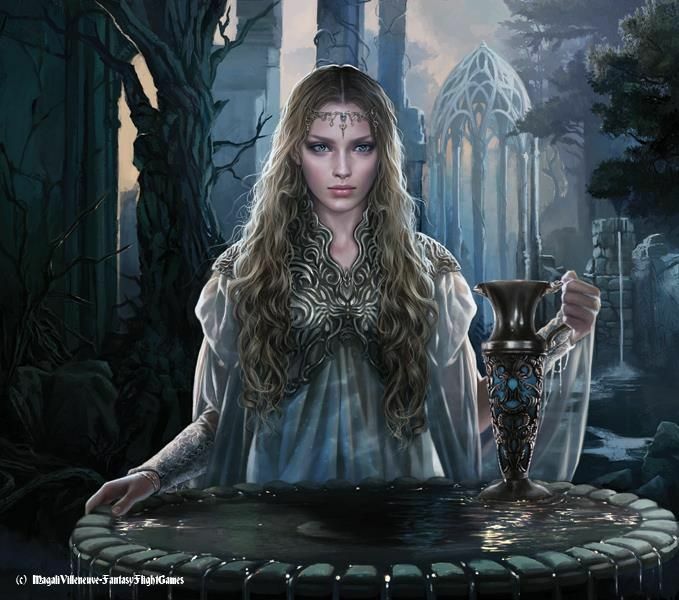 Alatáriel was the Telerin Quenya name given to Galadriel by Celeborn, meaning 'Maiden Crowned with Radiant Garland', which referred to her hair. At the time of her birth, Finarfin named his only daughter Artanis. Artanis (Q, pron. [ˈartanis], stem Artaniss-) was Galadriel's father-name: it means 'Noble Woman' in Quenya from arta and nís. Galadhriel was a name occasionally, and incorrectly, used of Galadriel after she became Lady of Lórien, and meaning 'tree-garland'. As the Lady of the Galadhrim, whose capital was at Caras Galadhon, it is perhaps understandable that her name should have become confused with the Elvish word galadh, meaning 'tree'. 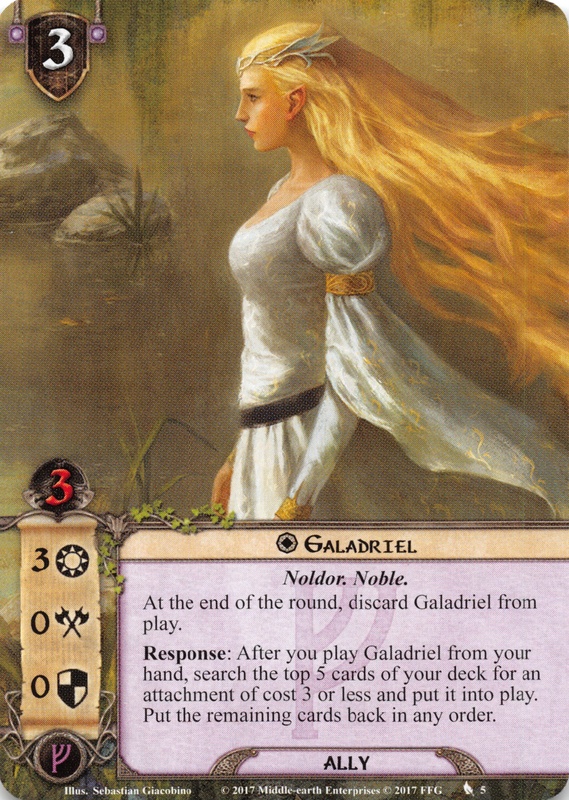 Nonetheless, this usage was mistaken — her true name Galadriel actually derived from the word galad ('radiant'), and the false variant Galadhriel was never used in her own country of Lórien.